Psarolepis romeri. Artwork by Nobu Tamura, 2008. Wikipedia, GNU Free Documentation/Creative Commons Attribution license. There's a good case to be made that Psarolepis is the most significant early vertebrate discovery in the last decade or two. It is difficult to think of another fossil that has so completely transformed our mental picture of a major early vertebrate clade. To be sure, that picture is no longer a pretty one. Psarolepis was, by any standard, an ugly customer. The dermal plates of the head were thick with a porcelain-like layer of cosmine, but deeply pock-marked with large, irregular pores, as unexpected and grotesque as a china doll with acne. The rostrum seems appears as though truncated and pushed inward, leaving a weirdly humped structure with sharp ventral curvature and anterior nares situated almost directly above the orbit. We might well suppose that Psarolepis derived from a shark-like form with an elongate rostrum and subterminal mouth. The anterior nares is said to contain a dermintermedial process. Since Psarolepis plainly has a posterior pair of nares and, equally plainly, lacks a choana, this is significant. It provides yet more evidence that the choana did not develop by division of the anterior nares but by migration of the posterior nares onto the palate. The median rostral overhangs the premaxilla and bears teeth. This is also true of Achoania, although the condition in Achoania is less extreme. The premaxilla also appears to reach the orbit. However, the exact osteology of Psarolepis is obscure. The thick cosmine layer all but obliterates most suture lines. Certainly the premaxilla is largely a palatal bone. Again, we might imagine it as the anterior member of the primitive palatine series which was exposed as the overhanging rostrum shrank back. 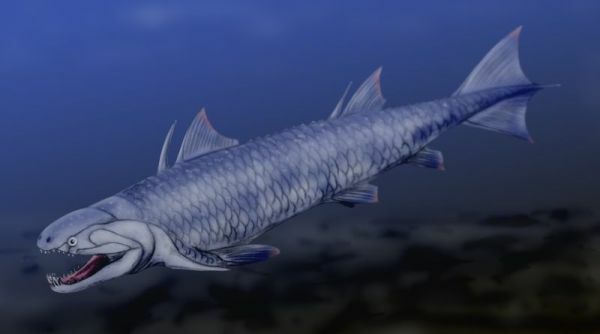 Compare the somewhat similar case of the early actinopterygian, Mimia, shown at left. Psarolepis has a sharp, horizontal dermal intracranial division. The otoccipital region is quite short, perhaps more like a holocephalian than a typical sarcopterygian. The Holocephali, too are probably derived from longer-snouted forms -- in that case, the Symmoriida. The jaw suspension of Psarolepis may be autodiastylic, the inferred ancestral state for the Holocephali. See discussion. Separate tabular and/or supratemporal elements may be present. The cheek region is poorly known. As in all early sarcopterygians, the homologies are very unclear between the jugal, quadratojugal, squamosal, preopercular and opercular. Both the maxilla and the dentary are short anteriorly but expand behind the orbit. This is often asserted to be the primitive osteichthyan condition. The braincase of Psarolepis is very well ossified, except for the ventral part of the otoccipital region. This region raises any number of unsettled, and sometimes unsettling, issues. While we do not claim to be experts in fossilized fish brains, we are not particularly convinced by the anatomical analysis originally published by Yu [Y98]. For example, the hyomandibula has never been recovered, so far as we are aware. Yet, it is said to be single-headed based on the nature of the hyomandibular articulation on the braincase. See, e.g., [L01]. But if this is the case, what can we make of the region marked "???" on the braincase diagram, below? 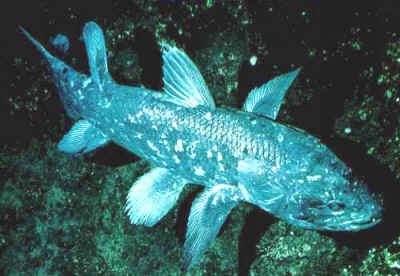 Psarolepis has turned out to be a very strange fish, not simply the primitive rhipidistian which Yu thought he was describing in his 1998 publication. In addition, there is considerably more material of Psarolepis known today. It may be time to have another comprehensive look at the braincase. One consistent feature of the early sarcopterygian palate is the small, thick parasphenoid pierced by a prominent, central hypophyseal canal and flanked by foramina for the internal carotids. An open bucco-hypophyseal canal appears to be the basal gnathostome condition, although the canal is convergently closed in almost all living gnathostomes. Maisey 2004). Another such feature are the deep internasal cavities on either side of the sphenoid. These provided room for the large parasymphysial tooth whorls which are now believed to be basal osteichthyan -- and perhaps gnathostome -- characters. Oddly enough, although this feature is often found in chondrichthyans, it is not known from the most basal forms [M+03]. The postcrania of Psarolepis are not very well known. The most spectacular findings were the fin spines. Two are known: a posteriorly-directed pectoral spine associated with the scapulocoracoid, and another believed to be associated with the anterior dorsal fin. As a result of this and other recent discoveries, fin spines are now believed to be primitive for gnathostomes. Again, it is notable that fin spines are apparently absent from the forms believed to represent the most primitive chondrichthyans, but present in abundance in more derived forms. Another interesting feature emerges from a closer look at the shoulder girdle image on the next page). Note the tall, pointed, dorsal process of the cleithrum. This is also said to be a primitive feature. However, this particular process, perhaps only through some accident of lighting, looks a great deal like an incorporated fin spine. All of this leaves a great many questions unanswered about the tangled phylogenetic knot at the base of the gnathostomes. We have deliberately emphasized some shark-like features here. We have done so in order to highlight one particular possibility: that the crown group gnathostomes sharks + lawyers) actually arose from a shark-like form -- perhaps something like a primitive version of Cladoselache which derived, in turn, from an early loganiid-like form. In that case, some difficulties with the original gnathostome radiation are elegantly explained. The basal crown gnathostome clades would be a bunch of poorly resolved chondrichthyan-like forms, Elasmobranchi, Holocephalii, Placodermi, and Teleostomi, in about that order, with most of the key developments not taking place until at least the Early Silurian. Of course a gnathostome origin from within early cartilagenous fishes is quite unlikely. However, all of these new fishes from the Pridoli and Lochkovian are showing us that we know much less than we thought we did and that it is time to reassess all of the possibilities. ATW040516. Revised ATW040910. Sarcopterygii: used here as Danny Boy > Danio. However Long 2001) defines it as the crown group: Actinistia + Tetrapoda + Dipnomorpha. Osteichthyes: Actinopterygii + * : Psarolepis + (Achoania + (Grossius + ((Onychodontiformes + Actinistia) + (Styloichthys + Rhipidistia)))). Characters: skull relatively akinetic; snout region larger than actinopterygians [BY01]; premaxilla does not participate in orbit [CA97$]; tectals present [CA97$]; infraorbital canal passes dorsal to external nares [CA97$]; posterior nares not associated with orbit [ZY02$? ]; parietal contacts supraorbital [CA97$? ]; anterior pit line on parietal [ZY02$? ]; dermal joint between parietal & postparietal [CA97$?] [ZY02$]; two supratemporal bones (supratemporal & tabular) [CA97$? ]; 3 extrascapulars [CA97$? ]; orbits relatively small [BY01]; orbits with more than 4 sclerotic plates [CA97$]; 2+ supraorbitals present [CA97$?] ; jugal canal present [CA97$]; squamosal & preopercular separate ossifications [CA97$]; preopercular canal not terminating on dorsal preopercular [CA97$]; posttemporal fenestrae present [CA97$? ]; hyomandibula with two proximal articular heads [CA97$]; dermohyal absent [CA97$]; otic region elongate [BY01]; unconstricted cranial notochord [CA97$?] [ZY02$]; supraotic cavity present [ZY02$]; basicranial fenestrae with arcual plates [CA97$? ]; dorsal endoskeletal articulation between ethmosphenoid & otoccipital blocks [CA97$?] [ZY02$]; usually with ventral braincase articulation directly below dorsal articulation [CA97$?] [ZY02$] [J+03]; exit of pituitary vein dorsal to vertical portion of basipterygoid process [ZY02$]; paired internasal cavities present [ZY02$]; parasphenoid with denticulated spiracular groove [CA97$? ]; parasphenoid does not reach ethmoid region [ZY02$? ]; mandibular canal does not pass through dentary [CA97$] [ZY02$? ]; splenial(s) present [ZY02$? ]; postsplenials present [ZY02$? ]; two infradentaries [CA97$]; surangular present [ZY02$? ]; prearticular ventral to coronoids & does not contact dentary dorsally [CA97$? ]; prearticular contacts dentary [ZY02$? ]; prearticular extends close to symphysis [ZY02$? ]; enamel on teeth [ZY02$]; parasymphysial tooth whorls present [ZY02$? ]; dentary tooth row not reaching mesial end of dentary [ZY02$? ]; one branchiostegal ray per side [CA97$]; supraneurals absent or present only on a few anterior vertebrae [CA97$? ]; dorsal fins with basal plate [CA97$]; caudal fin primitively heterocercal; fleshy paired fins with single basal and muscular lobes; anocleithrum present, not developed as postcleithrum [CA97$? ]; anocleithrum not exposed on surface [CA97$? ]; cleithrum, dorsal portion, inclined anteriorly [F+00]; clavicles triangular and in "close association" [F+00]; single basal (humerus) on pectoral fin [CA97$]; entepicondylar foramen present [CA97$? ]; paired fins with single axis; pectoral fin axis with pre- and post-axial radials [CA97$? ]; cosmine scales [ZY02$]; scales rounded [CA97$? ]; where scales become rhombic, scales with broad peg [CA97$]. Notes:  [CA96] note that this includes the "posterior tectal" of Jarvik. Links: link; Sarcopterygii ToL); Introduction to the Sarcopterygii; Sarcopterygii Mikko's Phylogeny); What are Sarcopterygii- lecture notes & slides: Best on the Web); Re- When did the Sarcopterygii separate from Actinopterygii-; CLASS OSTEICHTYES, SUBLASS Sarcopterygii; Sarcopterygii. References: Basden & Young (2001) [BY01]; Cloutier & Ahlberg (1996) [CA96], Forey et al. (2000) [F+00]; Johanson et al. (2003) [J+03], Long (2001), Zhu & Yu (2002) [ZY02]. ATW031010. Psarolepis: P. romeri Yu 1998. Phylogeny: Sarcopterygii : (Achoania + (Grossius + ((Onychodontiformes + Actinistia) + (Styloichthys + Rhipidistia)))) + *.